XR-5 was chosen as the primary and secondary containment liners for a state-of-the-art zinc and diversified metals production facility for its chemical resistance to sulfuric acid, kerosene, and weak hydrochloric acid. 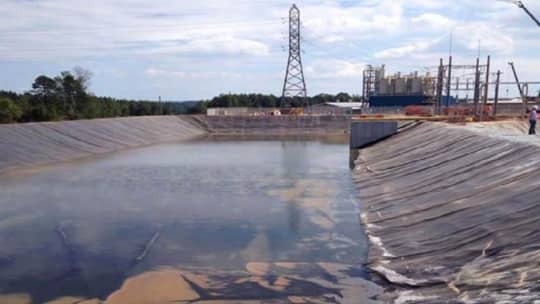 XR-5 Ethylene Interpolymer Alloy (EIA) geomembrane was specified as the primary and secondary containment liners for state-of-the-art zinc and diversified metals production facility in Mooresboro, North Carolina by the Horsehead Holding Corporation. Horsehead Holding Corporation committed to enhancing the environment was very proactive in complying with the environmental requirements of the State. “XR-5 was chosen for its chemical resistance to sulfuric acid, kerosene, and weak hydrochloric acid. A double liner system of XR-5 was used as one can’t afford for the chemicals to compromise the environmental area,” according to Bert Olah, Project Manager for CSD Engineers, Pittsburgh, PA.
XR-5 offers superior chemical resistance, high puncture resistance, ease of installation, ultraviolet light (UV) stability, low coefficient of linear thermal expansion / contraction (CLTE), and other high performance characteristics that are advantageous in the design and installation for the site. In Phase I of the project, the XR-5 is utilized as the barrier liner below the concrete floor of the settler buildings installation where the ZINCEX solvent extraction technology occurs. This extraction process is an acid leaching of zinc using a combination of acid raffinate and sulphuric acid followed by a solution neutralization step. The XR-5 proprietary formulation offers excellent resistance to a broad range of chemicals to inhibit migration of chemicals on-site into the surrounding habitat. The EIA coating allows the geomembrane to remain pliable; it is non-crystalline and not prone to environmental stress cracking. The XR-5 barrier liner below the concrete floor of the settler buildings offers exceptional puncture resistance which is particularly critical in the construction stage of the project. Heavy construction equipment is no match for the XR-5 geomembrane during the installation process. The tough geomembrane liner reduces costly repairs and on-site Quality Assurance of the containment system. These costs can more easily increase significantly with use of unreinforced geomembranes such as HDPE, PP, and EPDM which can be compromised. Cost of installation is further reduced since XR-5 can be prefabricated into large panels limiting in-field seams where unfavorable environmental welding conditions that can be detrimental to obtaining a quality weld can be present. Where non-reinforced geomembranes rely strictly on the film integrity for its durability, XR-5 utilizes a reinforcement base cloth of a weft-inserted warp knit that provides for a durable, high puncture resistance geomembrane. The EIA coating encapsulates the base cloth providing additional protective properties under extreme conditions. Thicker is not necessarily better as XR-5 out performs the thickest geomembrane by over 35% in puncture strength. Ease of installation of approximately 180,000 square feet of XR-5 proves to be advantageous to the contractor and set the stage for Phase II of the project consisting of open ponds. Seven ponds at the facility operate with a double XR-5 liner and geo-net system. The slopes of the pond below are continuously exposed to high concentrations of UV in the South Carolina sun. XR-5 has over 40 years of proven experience in exposed environments. XR-5 is not subject to degradation as a result of environmental exposure including UV, oxidation, and heat build-up. Due to the nature of the polymer, polyethylene geomembranes are prone to oxidation which is accelerated by exposure to UV decreasing the life expectancy of the exposed liner. These types of geomembranes perform best in buried applications. The change in temperature from day to night in exposed applications will affect the expansion and contraction of geomembranes. XR-5 has a very low CLTE (6.5cm/100m (0.78in/100ft)) as a result of the substantial reinforcement (base cloth) when compared to non-reinforced geomembranes (147cm/100m (17.65in/100ft) which utilizes a series of compressed films. Linear thermal expansion can have a detrimental effect on seams. XR-5 seams can run horizontal or vertical to the slope with no issues as the material remains stable. In addition, the adhesive coated base cloth provides the strength to carry the load when the seam is placed on the horizontal slope. The adhesive coat is essential in allowing the material to carry loads across a seam as it ties the EIA coating to the base cloth to inhibit the reinforcement from sliding out of the XR-5 matrix. Care must be taken with non-reinforced geomembranes and non-adhesive coated reinforced membranes as there is no reinforcement or adhesive coat, respectively, to carry the load. It is recommended on these membranes to run the seams vertical to the slope. Engineers can specify XR-5 on steep slopes without concern for seam failure due to high CLTE, strength or seam slippage. As standard operating procedure, XR-5 is routinely tested in the laboratory for high temperature loading of the seam at 71ºC (160ºF) at 534N (120lbs) for 4 hours meeting a maximum criteria of 3.175mm (0.125in) allowable seam slippage. This test is representative of horizontal seams on a slope in the field. In the Deadload illustration, the reinforced-no adhesive geomembrane sample, the reinforcement has pulled out of the seam, the exterior film is all that remains and the film draws. The geomembrane film sample has no reinforcement to carry the load and draws immediately. The XR-5 seam shows no signs of the reinforcement pulling out and the material adjacent to the seam maintains its integrity to carry the load. At the completion of the site, over 500,000 square feet of XR-5 was successfully installed at the Horsehead facility. XR-5 geomembrane’s chemical resistance provided a solution to a wide range of chemicals on-site. Olah commented “he never heard of any installation issues” supporting XR-5 ease of installation. The superior properties of XR-5 will provide for long-term protection that is required for this stringent environment.